As comScore and others have aptly demonstrated, the number of ‘likes’ is meaningless, yet many brands still rely on this metric as a primary performance indicator. ‘Likes’ rarely return to the brand page so future engagement is zilch. In fact, the majority of Social Media measurement is fairly mundane and definitely out of context when it comes to highly competitive categories. Measurement in a vacuum does not provide insight into where your brand stands vs. competitive Social Media initiatives. This insight has gone largely unnoticed by agency and brand Social Media practitioners. Why? Because many practicing Social Media come from PR or out of college with virtually no media training. Social Media is Media and requires a thorough understanding of media basics and cogent media analysis … especially Share-of-Voice. 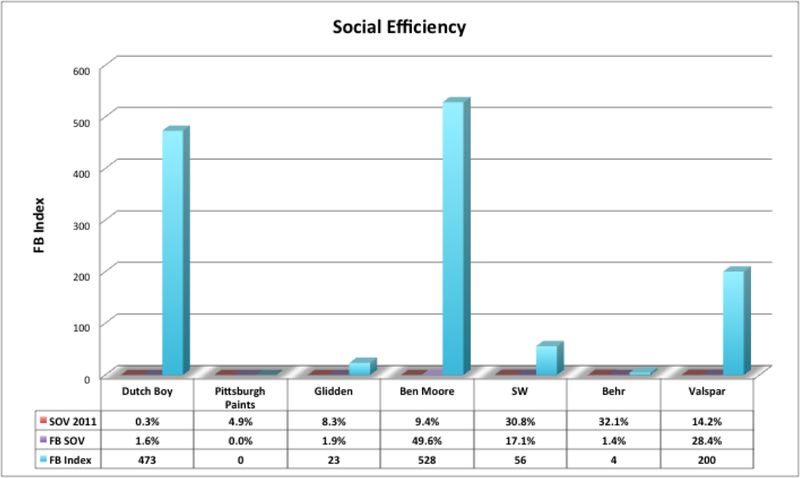 The following chart diagrams Social Efficiency for the paint category by comparing SOV in Facebook for the top brands to total SOV. While brands like Sherwin and Behr outspend the competition in TV, they were not dominant in Facebook at the time. Dutch Boy, Ben Moore and Valspar dominated in share of followers. This entry was posted in Social and tagged advertising performance, analytics, media measurement, media planning, precision targeting, sharing, social media, word-of-mouth. Bookmark the permalink.